Most people today who have an interest in good food know that not everything that looks like tomato tastes in fact like tomato. The same is true of basil and other herbs and vegetables. „Seasonal“ is a perhaps a wide term, but there is no hair-splitting about „the summer sun“. And that is precisely what the plants in our garden soak up so that they can become as aromatic as we want them to be. 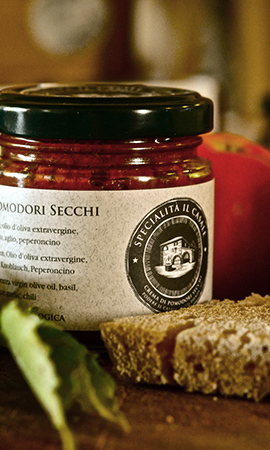 The pathway into both pasta sauces and pesto produced by the Podere Il Casale is only open to ripe and perfumed tomatoes and spicy, aromatic basil. 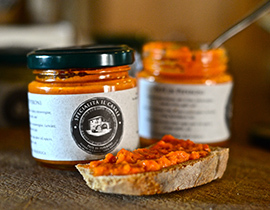 Using a gentle production process, we are thus able to confine a piece of summer into a jar, which will later recall exactly so many happy memories on the plate. An exception to the summer products is our rucola pesto. Since rucola only really flourishes at its best in the spring, our firm therefore produces this pesto exclusively from springtime growth. 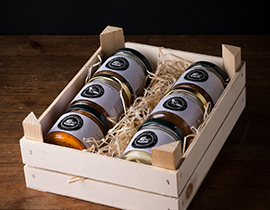 Due to the fact that only first-class ingredients lead to convincing cooking results, the sauces and pestos of Podere il Casale present a delicious accompaniment to pasta during that season when no ripe ingredients are available on the market. And as a greeting redolent of summer, they then taste twice as good! The innumerable tourists that stream into Italy each year can probably hardly know that owing to the poor quality of the soil on the farms of Tuscany such as Podere Il Casale, right up to the sixties of the twentieth century, hunger was often the rule. The eating of meat was heavily restricted to festivals and holidays. This is a considerable contrast to what many restaurants and taverns present today under the label of cucina tipica, as the „traditional culinary pleasures.“ Such menus never fail in the main nowadays to include meat! Wheat for bread, pizza and pasta, as well as pulses, formed the basis of the daily diet. The vegetables grown in peoples' own gardens brought a welcome change and important vitamins and nutrients. A slice of bread, known in the Italian kitchen as a crostino or crostone, could be garnished with a tasty spread made from simple ingredients. Vegetables in season, herbs, spices and good olive oil could make a simple slice absolutely delicious and healthier at the same time.